300 600 1200 2400 4800 9600 19200 38400 57600 115200 1/ baud = bittime in seconds. Technically, there is *no* RS-232 standard showing [how data bits are related to signal levels], and never will be because RS-232 is a level-zero = "physical" level standard. It defines wires, voltages and pins. What travels on that layer, the level-one or "transport" layer, is something else again. And asynchronous serial at a given baudrate is only *one possible* transport layer. Others are Bi-Sync, Manchester, HDLC/ NRZI etc. So, it is not RS-232 that we are discussing, [and which is typically associated with RS-232] it is asynchronous "teletype" protocol. 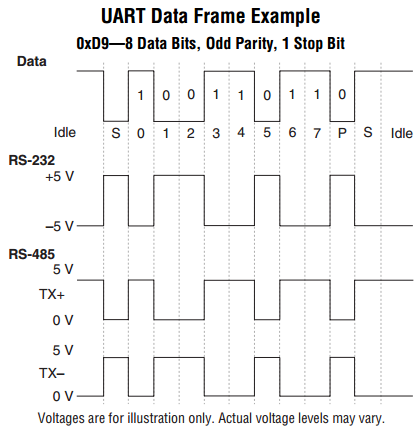 You will find it described in UART datasheets. The actual specification is at http://global.ihs.com/. $61 last I looked. Search for Document Number TIA/EIA-232 revision F. CCITT V.24 is the equivalent European version of the RS-232 rev E standard. Rev C spec's a max cable length of 15m. Rev D & E changed that to a max capacitive load of 2500pF. Rev D imposed a maximum risetime through the transition region of 5us or 4% of the bittime. Rev E just says 4% of the bittime. There is a 30V/us max slewrate. The spec (up to & including E) limits datarate to 20kbps, but if you extrapolate the (Rev E) risetime limit to its intersection with the slewrate limit, you get a max datarate of 200kbps. A stop bit happens to be a mark, a start bit is a space. The duration of the bits is determined by the bits-per-second rate of the line (often, but not always correctly, called the baud rate). So, on a 1200 baud link each bit lasts 1/1200th of a second. The thing about asynchronous comms is that there is, or can be, any amount of idle time between the characters transmitted. So the receiver can't synchronise itself to the incoming bit stream (hence "asynchronous"). When the line is idle, the transmitter sends out a continuous "marking" (negative) voltage. You might like to think of this as a continuous stream of stop bits. The receiver sits there drumming its fingers, having no idea when the next character is going to arrive. Eventually a character is transmitted. Here is the crucial part: the start bit is of opposite polarity, so the first thing the receiver sees is a transition from a mark to a space. The receiver now knows the precise moment in time at which this transition - the leading edge of the start bit - arrived. It also knows how long each bit (including the start bit) should last (i.e. 1/1200th of a second). So, it waits for the duration of half a bit and samples the voltage on the line again. This puts it right smack in the middle of the start bit. If it still sees a 'space' it knows the start bit is real (i.e. it wasn't just a noise blip on the line). It then waits 1/1200th of a second and samples the line yet again. This puts it smack in the middle of the first bit of the character. It continues to sample at 1/1200th of a second intervals thereafter until it gets to the stop bit(s). Once it has registered the stop bit it then goes into continuous monitoring mode in order to pick up the next transition to a start bit. You will see that the receiver's internal clock (for measuring out the 1/1200th of a second sampling intervals) doesn't need to be particularly accurate. All that's required is that it stays within half a bit over the duration of the received character. In other words, an accuracy of a few percent if fine. This means that asynchronous comms are cheap and easy to implement. [I made] an RS-232 network - ie, a bunch of PNP transistors with their collectors all tied together driving a single Tx line - ie, "wired-OR". Problem was, if one of the source ckts was "disconnected" from the line by simply turning it off, its PNP operated in the inverse mode to keep the ckt powered up - or at least partially powered up - and it loaded down the Tx buss. Solution was to put a diode between the collector and the common Tx bus. http://www.conserver.com/consoles/msock.html Really nice page with everything you need to know about connecting RS233 things together. http://www.al-williams.com/awce/rs1.htm If you use a solderless breadboard, there is a nice adapter kit available at this link. I have one - takes about 5 minutes to build and works well. http://www.ustr.net/8051pc/starting.htm see the section on synchronization. MicroChip has a very nice app note on rolling your own mouse. Both the Microsoft and Mouse Systems versions are covered. You might have to read a little PIC code to find what you want, but its there. The app note can probably be obtained from the microchip web site. App # is AN519. http://mondo-technology.com/qdft.html PIC based DTMF decoder with 9600 baud serial output. http://technet.microsoft.com/en-us/sysinternals/bb896644 Portmon is a utility that monitors and displays all serial and parallel port activity on a system. It has advanced filtering and search capabilities that make it a powerful tool for exploring the way Windows works, seeing how applications use ports, or tracking down problems in system or application configurations. I am trying to Upload Channel list from Satellite RX to Pc using Serial Cable.Getting reponse:- Serial Port Probe ERROR from Supplied Software Using Serial Cable And using USB serial adapter. Sat RX Manual says Use "twisted Serial Cable"? Should I be using Staight,Null modem or Tail circuit cable(DTE-DCE,DTE-DTE,DCE-DCE)? Sat RX'er is COMAG SL 65/12(Silvercrest) Operating Sys W XP Prof.
Can any one HELP PLEASE! Apologise if Should not be using this site! KILLspamrndelec at -Remove-cms.com asks: " Want to isolate RS232 serial port of My device. I am working on a program that requires to get some input from a serial port (RS232). There is a terminal which is sending some data to the computer from the weighbridge via the serial port. I would like to assign this value to a variable or send it to the text box. I am completely unable to figure out how I will achieve this in my web browser. I will really appreciate if anybody sent me some help on how to achieve this or possibly a code sample that should be able to pick read and display the results in a text box or label. Thanks in advance. Yours Sincerely, Leonardo Baima. How do I use vb to access an rs232 port? Ashley Roll has put together a really nice little unit here. Leave off the MAX232 and keep these handy for the few times you need true RS232!